Battalion Chief Dennis Devlin * Battalion 9, Lieutenant Glen C. Perry * Ladder Co 25, Firefighter Gerard T. Nevins * Rescue Co 1, Firefighter Mark P. Whitford * Engine Co 23 and Firefighter Robert W. Hamilton, Sr. * Squad 41. This memorial is Dedicated by the entire community of Washingtonville which takes so much pride in effort put forth by everyone to ensure no victims of Sept 11vare never forgotten. 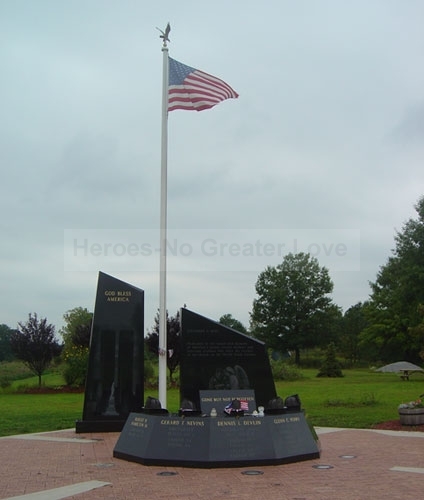 Although this memorial received a piece of steel from Ground Zero, it was not utilized when it was built, even though they were considering burying it under the ground, because the wives of the firefighters requested it be left out. We want to extend our thanks to everyone that worked so hard to put this plan into action.